Rift Valley Province of Kenya, bordering Uganda, is one of Kenya's seven administrative provinces outside Nairobi. Rift Valley Province is the largest and one of the most economically vibrant provinces in Kenya. It is dominated by the Great Rift Valley which passes through it and gives the province its name. According to the 1999 Census, the province covers an area of 173,854 km² for a population of 6,987,036 inhabitants, being the largest and most populated in the country. The capital is the town of Nakuru. Running from north, around Lake Turkana, it goes down through Kenya. The great Rift Valley Elgeyo escarpment is a tourist attraction. 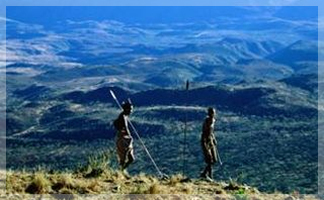 The geographical features of the Rift Valley are unparalleled in most parts of the world. The highlands also provide adequate rainfall for farming and agriculture which is the economic base of the Rift Valley People. Tea highlands are lush in Kericho. Besides this, there is horticulture which also brings in the needed economic empowerment to the Rift Valley. Cattle raising is also practiced to a large extent here. Economic potential of the Rift Valley is immense and it has not been fully exploited. Given the explosion of the population and the growing number of educated people in the province, this potential will be fully realized in the years to come. The people of the Rift Valley are hard-working and, were the economic conditions in the whole country to improve, they would benefit to a great extent. The people of the Rift Valley are a mesh work of different tribal identities. Most of Kenya's top runners hail from the Kalenjin community. The Maasai people serve as Kenya's international cultural symbol: the Maasai community have the most recognizable cultural identity in and outside Kenya. The Kalenjin and the Maasai are only a couple of the communities that call Rift Valley home. Other communities live here as well. People in the province are mostly rural, although they are growing more urban. Cities and towns have sprung up over the years to contain the rural-urban migration. Provided the right policies are instituted, Rift Valley province can emerge as the economic and cultural mecca in Kenya. Apart from the Rift Valley itself, the area has other important geographic features such as: the extinct volcanoes Mount Longonot and Mount Suswa and Lake Baringo, Lake Bogoria, Lake Magadi, Lake Nakuru, Lake Naivasha, the Suguta Valley, and Lake Turkana.